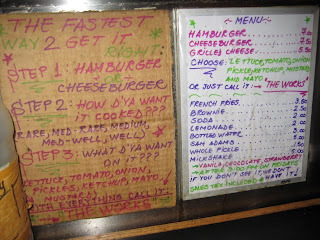 Our Expectations: Burger Joint's Cheeseburger, with "the works." "The works," as we had read beforehand, comes with lettuce, tomato, onions, mustard, ketchup, mayo and a slice of pickle. Yikes. A few toppings we'd like to chuck before even setting foot inside the place. Still, we heard the beef was the type that melts in your mouth, the stuff you'd crawl through a desert or more aptly, an NYC sewer, to taste. Meat: No doubt, this meat has flavor. But what makes it great is the tender juiciness. The type of texture that runs through and through, start to finish, with the first bite as good as the last. Considering its such a compact burger, that's quite a feat. Similar to that cookout burger (grilled on an open flame) you devoured at camp, but ten times better. Yet, without the orange drink and OFF bug spray. 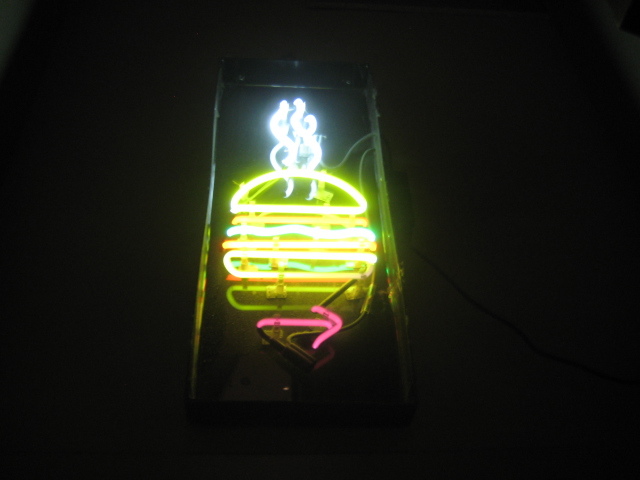 To our delight, it doesn't fall apart...a big sticking point, in our opinion, with many sub-par burgers. Even better, medium-rare came out, medium-rare...thank you Burger Joint. 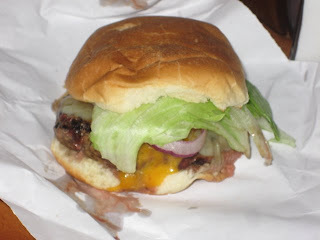 Having been one of the minor detractors from our previous review's ranking ( see Five Napkin Burger), Burger Joint got it right. They're seasoned pros, grilling the burger to perfection. A quick tip: You fellas (and maybe even some ladies) might want to grab seconds since one cheeseburger probably won't fill you up. Just remember they don't accept credit cards. Toppings: One of the weaker elements of this burger, the toppings are a bit average. That's what you should expect at Burger Joint, given the decor and burger style. Then again, that's not to say the place or the burger is average, but continuing with the camp cookout theme, the burger comes with those same campfire toppings. Sadly, it doesn't come with a hot co-ed counselor either...but we digress. Ordering "the works" gets you a few toppings we would instantaneously dismiss from our burger. Mustard, blah. Mayo, double-blah. Still, we dig the pickle, that crunchy dill type that adds some serious snap to your bite. As for the cheddar cheese, it's a solid sideshow to the beef. It melts like it should, draping over the sides of the meat but still keeping its composure. That counterbalances the "just OK" toppings since the cheddar allows the meat to remain the star. Exactly what we want and why we're here. Despite that, those formerly mentioned toppings bring the ranking down a notch...sigh. Bun: Soft white roll, once again (a la Five Napkin). Slightly grilled, not charred, and done with perfect timing. 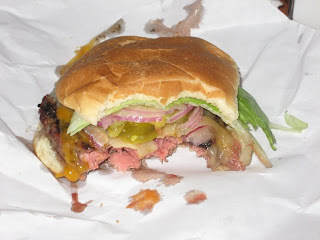 The bun covered the burger, didn't fall apart through the entire eating experience, and wasn't overwhelming while letting the meat keep spotlight. Still, nothing to write home about (get it?). Meat (43): Awesomely cooked to temperature, flavored with that purpose we had hoped for and good 'til the last bite. The star of this burger. Toppings (18): Average, but what we expected. Maybe some grilled onions could do the trick? Bun (20): Just right. Not a star, but done well and chosen wisely. It says, screw those sesame buns. Simply awesome reviews- especially since we're not burger savvy,BUT we do know great taste and you make it sooo easy to separate "THE MEN FROM THE BOYS".On our next jaunt to satisfy our burger addiction we will definitely rely on your recommendations which are thoughtful,concise,thorough and to the point.Hey, a bit of red meat never hurt anyone just don'T TELL OUR CARDIOOGIST! Keep reviewing and we'll keep reading. Thanks. Mustard belongs on hot dogs, but never on a hamburger! Pickles are welcome, mayo, ketchup, and onions can be ok, but the burger has to be the star. We love the comments everyone, you guys rock. Anonymous #1: I disagree, but to each their own. Mustard on a Hot Dog, for sure! I agree with Jeff there. On a Burger, not in my book. I sometimes have to steer clear of the ketchup as well. It just detracts quite often from the flavor of the meat. Anonymous #2: Thanks for the kind words, we can feel the love!